We wish you the best as you complete your 2015/16 academic year and invite you all to return as Colonels in the Fall! Dual Credit Applications – The Fall 2016 Online Application is now available! 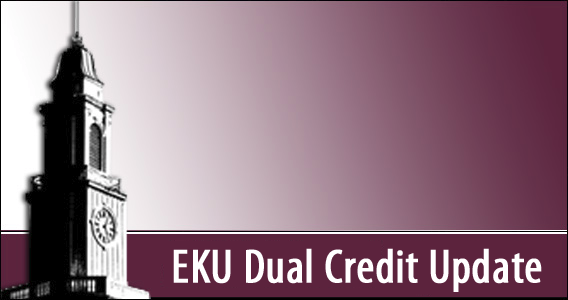 You can find the link on our website at http://dualcredit.eku.edu/how-do-i-apply-0. In addition to the online portion of the application, students will need to print out the Tuition Acknowledgement Form or obtain one from their high school counselor and have a parent or guardian sign. The online application will be complete when EKU receives the Tuition Acknowledgement form and end-of-year high school transcripts with qualifying ACT/PLAN scores and GPA’s of 3.0 or higher. Please let us know if you have any questions or if you experience any difficulties with the online application. Mary Jo Young Scholarship- The Mary Jo Young Scholarship application is now available online for the 2016/17 academic year. This scholarship may be used to reimburse textbook costs and dual credit tuition. This scholarship is made available through Kentucky Higher Education Assistance Authority. The deadline for application is May 15, 2016. To apply for the scholarship and for details on award amounts, go to: https://www.kheaa.com/website/kheaa/mjyoung?main=2. This application will not likely be made available again for the 2016/17 academic year; so interested students should apply now! When applying, home school students must choose the school that they would attend and then contact Danny Prather at (502) 696-7399. Tuition and Dual Credit Scholarships– Tuition has been approved at $65 per credit hour for 2016/17. Dual Credit scholarships are available to both juniors and seniors who meet specific criteria. No additional scholarship application is required. Please check the attached Tuition Acknowledgement form for additional dual credit scholarship information. ACT Tests – There are still some National ACT and Residual ACT tests scheduled prior to the June 15 EKU Dual Credit application deadline. The cost of the Residual ACT is approximately $55. Scores from the test dates below may be used to qualify for EKU Dual Credit and/or EKU Dual Credit Scholarships. Remember, Residual ACT scores “reside” at EKU; they cannot be transferred/communicated for use to other colleges/universities or your high school. Students must make a testing appointment for the Residual ACT. EKU’s Academic Testing website can be viewed at http://www.testing.eku.edu/. Call859-622-6637 to register for the test. Call 606-528-0551 to register for the test. Call 606-598-8122 to register for the test. KYOTE/COMPASS– If students meet the 3.0 high school GPA and 20 ACT/PLAN composite requirements, but do not meet the ACT/PLAN sub-score requirements (English, Math and Reading), they may take the KYOTE, COMPASSor an EKU placement test to achieve equivalent scores. COMPASS test sites can be located at http://www.act.org/compass/sites/index.html. Final Grades– Final grades will be posted in EKU Direct for students on Tuesday, May 17, 2016. Transcripts– To order an official transcript, go to http://registrar.eku.edu/transcripts. Thank you and best wishes on your final exams!